Summer in Vermont is full of berries. I revel in spending hot July days plucking warm, ripe raspberries from the Fresh Tracks Farm raspberry bushes. And between the pies, jams and coulis, I sometimes get the yearning to experience complex berry flavors in a savory dish. 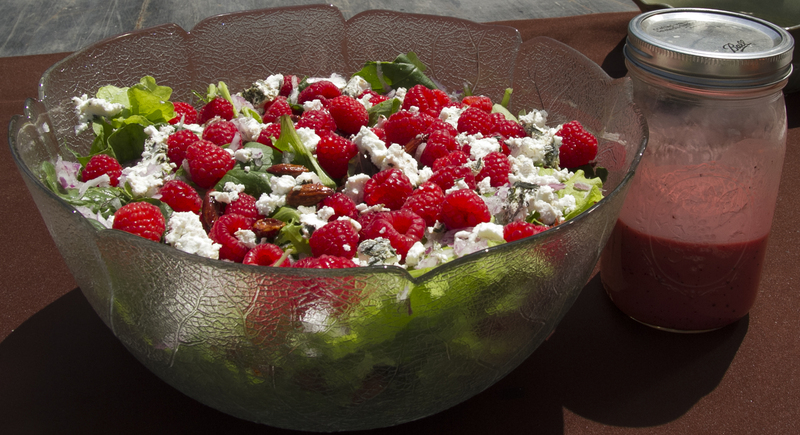 This delicious raspberry frontenac gris dressing is a perfect companion for a light summer salad with crisp greens, aromatic onions and creamy goat cheese. And of course, more raspberries! In a medium-sized, non-reactive saucepan, bring the Frontenac Gris to a boil. Reduce the heat to a gentle simmer and add the raspberries. Simmer until reduced by half—about an hour. When the mixture is reduced and slightly thickened, remove from the heat and allow to cool. Once the raspberry-gris reduction has cooled, strain the seeds out using a food mill or china cap. Place the remaining liquid into a blender or food processor, and add the ground mustard. With the blender on low, begin slowly adding the olive oil, a drop at a time, followed by a few drops of lime juice. As you add these ingredients, pay close attention to the consistency of the mixture, which will take on a thickened quality as it begins to emulsify. If you are having difficulty starting the emulsion, add a bit more ground mustard (an emulsifier) and start again slowly. It is important to keep the mixture blending slowly but continuously during this time, and to add the oil and lime juice just drops at a time until the emulsion is well-established. Once you see that the mixture is thickening and holding together, you can begin to add both olive oil and lime juice in very thin alternating streams until you’re satisfied with the flavor and consistency of the dressing. Add salt and pepper to taste, and blend thoroughly. Serve chilled over salad or steamed vegetables. A perfect pairing with Frontenac Gris wine!